Chrysocolla's fabulous mix of kingfisher blue, emerald green, turquoise and lime is gorgeous for summer and a brilliant cheer up in the winter months. Chrysocolla is a dense stone and quite soft so our stones are polished and have a protective coating. Take care of your chrysocolla pendant and wrap it carefully in a soft cloth when not worn - a rare occurrence as you'll never want to take it off. 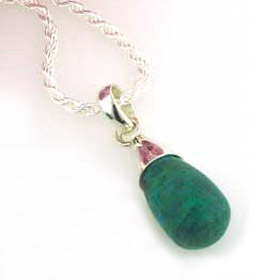 Treat yourself to a chrysocolla pendant! 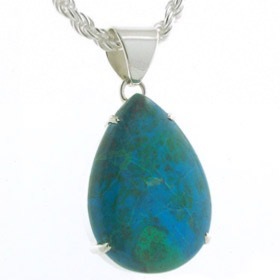 Your chrysocolla pendant will coordinate beautifully with teal, turquoise, navy, jade and bottle green. It'll show up wonderfully on black.